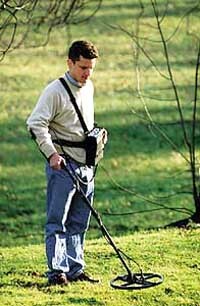 The LORENZ PULSE 5 is a very versatile metal detecting system which was designed to locate both small and large metal objects. Different Searchcoils ranging from 10’’ (26 cm) diameter to 80” x 80” (2 x 2 m) frame mounted coils can be connected to the LORENZ PULSE 5. A special feature automatically adapts different searchcoils to the electronics. There is just one Detector necessary which offers best performance with any coil connected. The LORENZ PULSE 5 is based on the Pulse Induction principle which guarantees extreme detection depths even in soils with high contents of ironoxides or conducting saltwater. The LORENZ PULSE 5 responds very sensitively and precisely to small non-ferrous metal objects like coins for example. A target classification with conductivity meter reading offers more information in order to identify metal objects. Small unwanted metal objects like nails for example can be eliminated with three different delay settings. Especially while searching for large and deep targets with frame mounted searchcoils, small unwanted items will be eliminated automatically. A wide range of searchcoils are available as accessory. Different sized frame mounted searchcoils can be easily made from PVC pipes and the universal cablecoil (accessory). The maximum detection range of a 40’’ x 40’’ (1 x 1 m) frame mounted coil is 217’’ (5,5 m) and can be increased to 315’’ (8 m) when enlarging the frame to 80’’ x 80’’ (2 x 2 m). The LORENZ PULSE 5 can be used for many different search and location applications like the detection of coins, metal fragments or barrels at detection depths of several meters. The LORENZ PULSE 5 guarantees best performance even under the worst environmental conditions. Operation frequency: small / large coils connected: 1300 / 700 pulses per sec. Zero-pushbutton-control: Automatically retunes the complete electronics while pressing. Audio-threshold-control: The initial tick-rate can be altered from silent to a slow ticking-tone. Frequency control: The preset operation frequency can be altered to reduce interferences produced by powerlines or transmitters. Indicates that a new conductivity meter reading is stored and displayed on the meter. Comes on when the Battery is discharged.